﻿Prouty Beach is a 36 acre park with breathtaking views of Lake Memphremagog and Downtown Newport. The facility hosts over 75 campsites and amenities including tennis courts, playground, disc golf course, basketball court, shuffleboard and horseshoe pits. Located conveniently off I-91 across from North Country Union High School and less than one mile from Main Street Newport, the park is a local favorite for day use and over-night stays. The lower beach building houses boat and bike rentals and access to bathrooms and changing facilities for the waterfront. Prouty also provides parking areas for hiking and biking on the Newport-Beebe Bike Path and nearby fishing areas inside the park. The family camping experience at Prouty Beach is one of the most exceptional in the state. Visitors return year after year for our relaxing atmosphere, welcoming community and beautiful park. Access to on-site docks, swimming area, horseshoe pits, walking paths, shuffleboard courts and disc golf course are just a few of the recreational amenities your family will enjoy during their summertime stay on the shore of Lake Memphremagog. Guests also have access to on-site washer and dryers, hot showers, tidy restrooms, free wi-fi included with their stay. 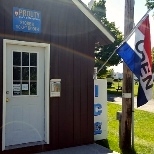 Whether you've booked an overnight stay or you're a day visitor to the park, the Prouty Campground store has a complete variety of summertime necessities. From sunscreen to s'mores, bug spray to swim floaties the ticket booth carries many convenience items and snacks. Stop by for an ice-cream cone, and pick up a souvenir to remember your trip. Host your next company party or family event right on the waters of Lake Memphremagog! The beach-side pavilion at Prouty Beach is the perfect host outdoor picnics or barbecues during the spring, summer and fall. The venue has water, power, a very large charcoal cooking pit, over a dozen picnic tables and optional tent sides to protect your part if the weather turns. For smaller gatherings, the upper 30x30 tent shelter is available for rent from June-September. This space has 6-8 picnic tables and is located just steps away from restrooms, playground, tennis and basketball court amenities at Prouty. Request a facility reservation. Prouty Beach four tennis courts, a basketball court, little league field, softball field an multi-purpose field (used for soccer, field hockey, football) Evening lighting is available over the tennis courts, making it a great location for local and regional tournaments. Prouty Beach is home to Junior Falcon football practices and an active pick-up basketball group in the summer. Request a facility reservation. OFF-SEASON RESERVATIONS: Prouty Beach Campground is open from May-October. To book your summer reservation during the off-season, please email the Campground Office with your name, the dates of your stay and your requested site number. Messages are checked once weekly and handled in the order which they're received.